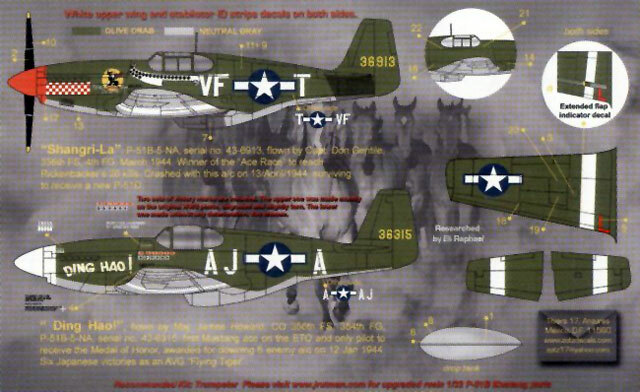 Zotz Decals latest in its line of fine quality decal sheets covers the P-51B Mustang in the European Theatre of Operations. These decals have been designed for the new Trumpeter kit in 1/32 scale. P-51B-5-NA Mustang Serial number 43-6913, VF-T, “Shangri-La” flown by Capt Don Gentile of the 4th FG, 336th FS in March 1944. The aircraft was finished in Olive Drab upper surfaces and Neutral Grey lower surfaces and has a red propeller spinner, red nose ring and red and white chequer band running along the side of the engine nose. The aircraft has nose art of a boxing black eagle on a yellow disc painted on the left engine cowl. A white scroll with the kill markings is painted below the cockpit. White theatre bands are painted on the upper and lower surfaces of the wing and on the horizontal tail surfaces. P-51B-5-NA Mustang Serial number 43-6315, AJ-A, “Ding Hoa” flown by Major James Howard the CO of the 354th FG, 354th FS. The aircraft was finished in Olive Drab upper surfaces and Neutral Grey lower surfaces and has a white propeller spinner and white nose ring. The aircraft has nose art of the works “Ding Hoa” painted on the left engine cowl and kill markings painted below the cockpit. White theatre bands are painted on the upper and lower surfaces of the wing and on the horizontal tail surfaces. This aircraft was fitted with a Malcolm hood. This is a high quality product that will enhance and customise your new 1/32 scale Trumpeter P-51B Mustang.